It was cold and very snowy on Saturday when more than 80 people braved the weather to count birds for the Pittsburgh Christmas Bird Count. We learned the preliminary results last night at the annual CBC Dinner. Like all counts, Pittsburgh’s circle has a diverse landscape within its 15 mile diameter. Over the years the circle has seen a lot of residential and commercial development but something made this year special. Even though all the data wasn’t in yet, we tallied 76 species including tundra swans, common goldeneyes, ravens, red-breasted nuthatches, white-winged crossbills, pine siskins and a short-eared owl (an unusual owl for the Pittsburgh circle). 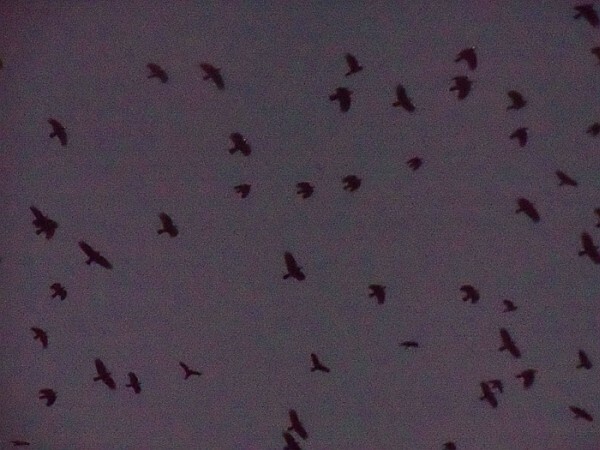 For sheer numbers, though, the crows won hands down. Sue Solomon, Claire Staples, Joellen Popma and Jana Oster stationed themselves near the Strip District roost before sunset and counted crows until it was too dark to see. By then they’d counted more than 18,000 and more were still flying in. Added to those seen in the rest of the city, the total number of crows counted in the City of Pittsburgh on December 29 was 20,058. And that doesn’t include crows in other parts of the circle! To get an idea of what the counters saw last Saturday, here’s a video from Sharon Leadbitter taken in the Strip District exactly two years ago today. Yes, the crows have been coming here for years. Yesterday afternoon was driving down Brighton Road on the North Side and spotted a HUGE number of crows in a cemetary around Woodland Avenue. They were having a grand time preparing for New Year’s Eve! I don’t know our count totals, but there may be more crows in Pittsburgh than all birds in Albuquerque.